The City of Abbotsford is running a comprehensive planning process to create a neighbourhood plan for Abbotsford’s Historic Downtown. The Historic Downtown Neighbourhood Plan (HDNP) will create a guiding vision for the neighbourhood. This stage analyzed how the Historic Downtown area functions and looks today, to inform the following stages of the planning process. This stage explored options for the HDNP through a broad engagement process and resulted in four preliminary concepts for the plan. In this stage, a draft plan was prepared by City Staff and presented to Council. The plan was created using the results of the research, public input, and stakeholder meetings conducted so far – including an online survey which received responses from over 6,000 residents. Stage 4 is underway and is focusing on refining the HDNP. This stage included continued stakeholder meetings and a final public engagement event that took place at the beginning of December. City staff are now preparing a final bylaw for Council to consider adoption in early 2019. One major aspect of the HDNP is the land use map (shown to the right) which will guide future development in the area by assigning a land use designation to each property within the plan boundaries. Land use designation dictates the potential future zoning for a property. Designations are adopted as part of an area plan, like the HDNP, and provide guidance for the municipality’s consideration of rezoning and development applications for a property. The current zoning bylaw, also referred to as “zoning”, is the guideline for how each property may be used and developed at that point in time. These bylaws divide a city into zones and establish procedures for processing and deciding upon development applications. The map below is the draft land use map from the Historic Downtown Neighbourhood Plan. It assigns each property within the plan boundaries a land use designation. 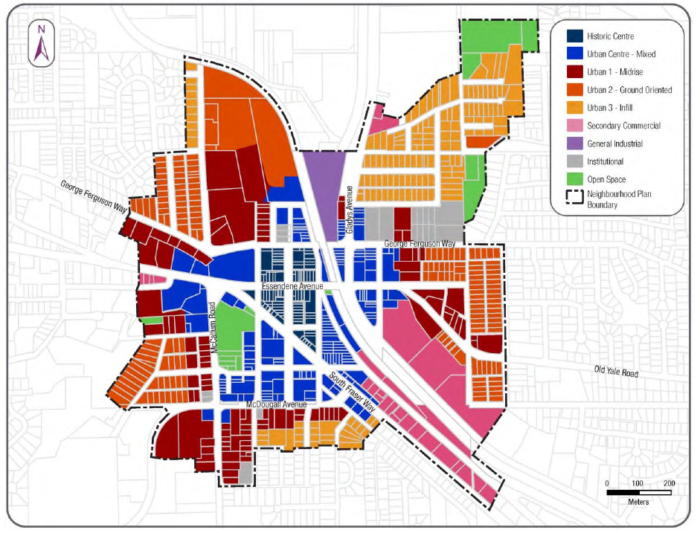 This map, along with the rest of the plan, will guide the future of the area. The City is committed to enhancing the existing community of small, independently-owned shops, restaurants and other businesses that are characteristic of the neighbourhood while encouraging more places for people to live, work and play making it a more complete neighbourhood and city-wide destination. In short, the new plan will incite change in the neighbourhood over the coming years. The change in land use designation specifically will result in some properties becoming more valuable based on their land use designation and the resulting redevelopment potential than when valued at their current zoning. This will impact how property owners or any potential buyer will value properties in the area. If you have questions, please contact George Richmond. We’re happy to share what we know about the future of the neighbourhood. The City of Abbotsford also has excellent online resources where you can learn more about the planning process and see the draft plan in its entirety. These resources can be found as part of the Plan for 200K: abbotsford.ca/plan200k. In addition to the above, the City of Abbotsford has many resources where you can learn more about current and future redevelopment and other projects in the neighbourhood. If you haven’t already, we recommend you visit the City’s website and familiarize yourself with their online mapping system which provides plenty of planning and development information including in-process applications. The map can be accessed directly at maps.abbotsford.ca. 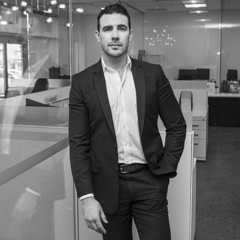 George Richmond is a commercial real estate agent at Frontline Real Estate Services, specializing in sales and leasing with a focus on office and retail properties located in the Fraser Valley.